Blockchains and the Future of Finance: What problems do blockchains solve? As everybody knows, in the year 2008, a very mysterious person—still unknown—proposes this payment system called Bitcoin, which has gone live. This is the kind of new story that got me interested in this about four years ago: a couple on their honeymoon, who are going from Stockholm to Seattle to Berlin, and so forth. For more than 100 days, they live only on Bitcoin. In other words, they drop off the grid and live in this parallel world, where there’s a new payment system with no government connected to it, and are able to support themselves, because there are enough hotels, food shops, travel providers, and so forth that they can pretty much opt out of the society we know and pursue their own life with a totally unregulated environment. This has come further, faster than anybody would have imagined. Where we are with this right now is you have this security that is trading recently at the price of about $900 for one Bitcoin. If you had invested in this about two years ago, it’s enjoyed a very nice run up. I don’t really want to dwell on Bitcoin. As most people know, there are limits to Bitcoin. It’s never going to become the world’s super-universal currency, because of certain bottlenecks that are very hard to get around. What’s much more important is the technology behind it. The so-called blockchain, and distributed ledger that were innovations that had been around for some time, but that are brought together in a particularly clever way by the designers of Bitcoin. And [they] are now really threatening to remake the world’s financial system from the top down, in a way that threatens the existence of all the banks, stock exchanges, and all of the legacy financial institutions that you’re probably very familiar with, and are probably thinking that you might get a job with at some point. I expect that, within the next 10 years, probably half of the banks would be gone. They’ll probably merge with each other in a series of defensive mergers. Many of them are actively using current regulation to try to co-opt this technology into their business models, at least in a limited way, to forestall what looks like a very serious day of reckoning that may not be too far into the future. I’m not sure that stock exchanges will continue to exist, or things like the Chicago Mercantile Exchange. If they do, they’re probably going to be greatly reduced in size, much simpler, more streamlined, and ultimately more beneficial to the customer. To put this into context, you have to consider this to be part of the peer-to-peer sharing economy that has been growing in different forms around the world over the last 20 or 30 years. One industry that is a particularly good point of reference would be the music industry. Do you remember record stores, Tower Records, Sam Goody, and so forth? Those are gone now, except for nostalgia and so forth. This used to be how people distributed music, and it was a huge industry employing thousands of people around the world. Napster changed all that. Napster was a file-sharing service that was developed by a kid in Massachusetts about 20 years ago. It made it possible for people to copy and share music in a way that, maybe, was or was not legal, but spread like a virus and completely changed the distribution of music. There’s more music being produced today than ever. The technology has been co-opted by people like Apple. You now get your music on iTunes, but you get it in a very different way. For 99 cents a track, it’s not bundled in albums. The amount of money being made by everybody, from the recording artist on down, is completely different. eBay is another peer-to-peer system that matches up people with things in their attic, with people who happen to need them. Unlike Napster, eBay is different, because it creates a market that didn’t exist before. It greatly expands the market for used goods, and it’s hard to identify anybody who’s a loser. The two big companies operating in this space, who many of you probably have first-hand knowledge of would be Uber and Airbnb. Uber is decimating the taxi industry. Even here in Chicago, I’ve used it three times already since I got here. I haven’t used the taxis at all. Uber is also creating a bigger market. There are actually more people taking rides, more people employed, but in a very different way. Airbnb is the biggest hotel company in the world by room nights. The regulators are allowing things like the merger of Marriott and Sheraton, the legacy hotel chains. They realize that the entire industry is now being remade and disrupted from the top down by a completely different business model. Each of these companies has a market value somewhere north of $50 billion, if you look at what investors are paying to buy new equity in them. By now each of these companies ordinarily would have gone public on the stock market, under normal conditions, but they are both studiously avoiding this. What is likely to happen is that they will go public, and many other of these unicorn technology companies will probably also go public, but in a very different way. They will probably go public in a blockchain stock market. In fact, this is what I’m going to talk about in the next lecture: how corporate finance is likely to look on these new platforms. What’s the last big IPO that you can actually remember? Nobody is interested in the old stock market, and in underwriting the way that we know it, with the spreads, the asymmetric information, and so forth. The way that these people are raising capital, or thinking about the financial structure of the firm, is really quite different than anything that we’ve seen before. What about in the financial services industry itself? PayPal is a very interesting early mover in this field. It allows essentially two individual people to transfer value. There is a credit card company intermediating these transactions, but PayPal has branched out into other services like Venmo and other mobile payment apps that are very widely used by young people and have questioned the need for the middle man and the types of services that traditionally banks and credit card companies have provided. In the developing world, you see things like M-Pesa. M-Pesa is a service in Kenya that allows you to use mobile phone minutes as a way of transferring value. It’s essentially a remittance service. In a country like Kenya, there are many, many people who don’t have bank accounts, but almost all of them have mobile phones. If you are working in the city and you have a mother in the village 1,000 miles away, you can charge up your phone with minutes, zap them to her phone, and she can then liquidate them locally or even spend them as currency. This became, in other words, a serious rival to the government’s currency. The threat to a sovereign government when a commercial provider can come in and provide financial services better than the government can, the threat to the government’s ability to control the population and the economy is all too obvious. The big breakthrough comes with Bitcoin. 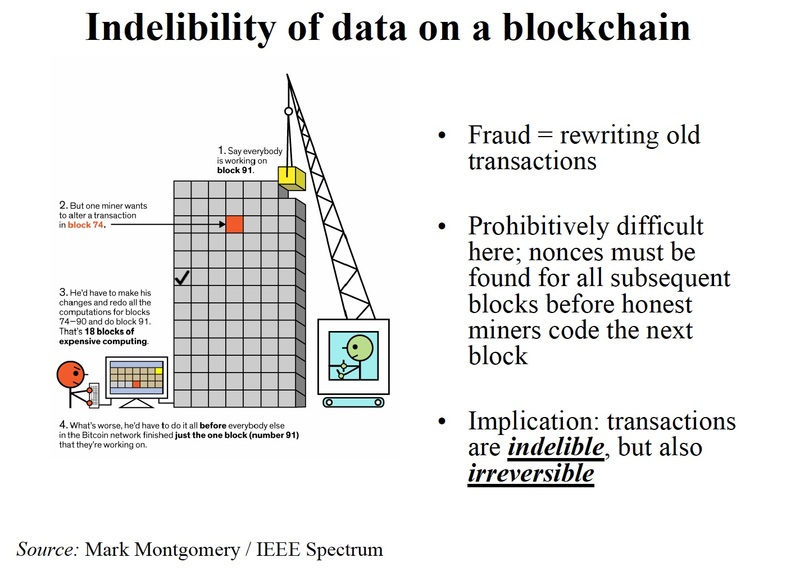 I don’t want to dwell on Bitcoin in this lecture, but I am going to go carefully through the design of the blockchain and the architecture behind it, and so forth. The key is this: Who comes in the middle? The PayPal network ultimately depends on MasterCard and Visa to process the payments, and they take a cut. M-Pesa depends on the phone company to act as the middleman. Bitcoin is completely different because there is no third-party central authority. There is a cryptographic process where essentially the consensus of the people on the network validates payments and transactions. The removal of any third party is really what the innovation here is. At first, it was only obvious to tech people and computer scientists who were looking at this, but when you really stand back and understand what’s going on here, it gets you right away into asking questions like: do we really need to have banks in the future? We’ve had banks for thousands of years. Banks are some of the oldest institutions in society. They seem to have come up with a way that questions, is there any value to them? Do they perform any service that we couldn’t just perform collectively among ourselves? I would recommend that you download and spend the 20 minutes to read this if you want to get a point of entry to the literature, because it is a well-written, very thorough description of both the structure of this and the range of potential applications that it has. I want to focus mostly on the financial industry. Here’s one article from the Wall Street Journal talking about one bank, which happens to be UBS, one of the two big Swiss banks. To pull out a couple quotes, they say that the blockchain has been increasingly eyed by mainstream financial institutions as a breakthrough. It could enable them to settle trades in seconds rather than in two or three days. The technology could reduce the infrastructure costs of the bank by as much as $20 billion a year by 2022. This is one bank that thinks it could save $20 billion a year. Multiply this across all the banks, and there’s probably 30 or 40 banks in the world the same size as UBS. It’s a timeline that starts in 2014, and what they’re marking is the first publicly announced investments by legacy banking firms in the blockchain technology. At first, these are people that you haven’t heard so much about, although New York Stock Exchange and Goldman Sachs are early adopters. In the fall of 2015, a little over a year ago, there’s just a mass of banks basically acting out of the same impulse, which is fear. As I hope is clear within 20 or 30 minutes, this really calls into question why you need banks at all. What’s going on right now is a search for how they can use this technology to create barriers to entry that will allow them to prolong their franchise for another 5 or 10 years. I think in the long run, this is a losing proposition. The models that the banks are using are really quite restrictive. They’re not taking full advantage of the technology and ultimately, they are probably going to lose out in the marketplace as a younger generation is much more comfortable with handheld commerce; peer-to-peer, much cheaper transactions that are simply going to cause the banks, I think, to wither away. We are at a point of great acceleration and inflection, where the proof of concept work is well underway and a lot of this has really been completed to a lot of people’s satisfaction. There was an announcement just this morning [January 9, 2017] in New York by the Depository Trust & Clearing Corporation that they’re going to move a lot of their derivatives market to a blockchain platform, with IBM as the main vendor. Organizations like the DTCC, which does a lot of the derivatives for the whole United States, these are the big boys. What they’re clearly worried about is whether the need for them to exist at all is going to continue. You’ve got all of the big players in the market now taking note of this technology and do we need all of these things in the future. It’s very much on the minds of everybody. I think in the long run, the biggest applications are actually in the public sector. I think anything kept track of on a database is amenable to the use of a blockchain. Nobody has bigger databases than the government, which has things like demographic records, Social Security, driver’s licenses, also property registration for real estate and motor vehicles and so forth. A number of governments around the world are looking at this very, very aggressively. I would cite the United Kingdom and Australia as probably the two most active. The cost savings in the public sector have such a huge opportunity in terms of reducing the taxes of the population and so forth. 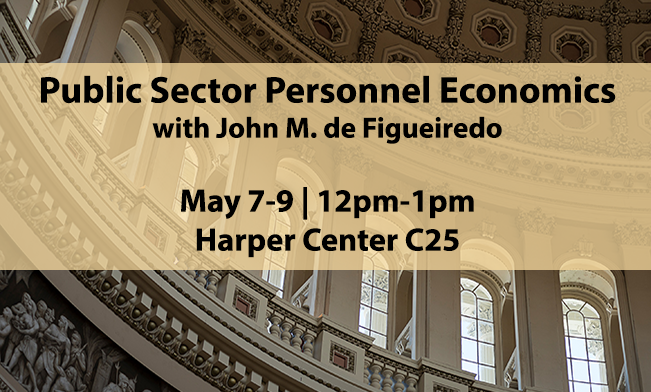 I think in the long run, where you’re really going to see this most in your daily lives and see the biggest economic impact is in improving the efficiency of the public sector. That will come later. Whether you need people like auditors, who are in the trust business, who verify the behavior of other people; Whether you need lawyers to settle disputes in a world where there are smart contracts that execute themselves—all of these questions are now up for grabs and creating a lot of concern, but at the same time, a lot of opportunity. Here is my last intro before we get into some of the details, an announcement by a European bank, Commerzbank in Germany. It says that they are going to cut 10,000 jobs, which is roughly 20 percent of the workforce. Most of you guys, I guess, are MBA students and these are not the kind of stories you like to see. My school is heavily focused on finance, for better or for worse, and in fact, many of the employers are banks in New York. These kinds of stories are coming out a lot. It’s not just Commerzbank, but also Citibank and Goldman Sachs and [firms] like that, who already have or actively are shrinking their headcount. If you read further, it says simultaneously they plan to hire 2,300 new staff focused on digitizing internal processes. The only people the banks want to hire anymore are quant people. I don’t mean financial quants, I mean people who can code, who know big data. Data analytics and programming in Python and things like that. The old jobs of analysts and loan officers, sales and trading, those jobs are gone. This is a big problem for us in New York, as a business school, because these are the jobs we know how to train people for. What we’ve seen is that the career office is not seeing these people come to hire anymore, and students are no longer enrolling in these courses. I’m the department chair, so I assign people to teach—and I’ve got a lot of faculty who want to teach stuff where nobody’s enrolling. Getting them to learn this blockchain stuff is a very, very difficult resource allocation problem. We’ll solve it in the long run. In fact, we’re introducing a lot of FinTech courses in our program. This is the job market that you guys are looking at. Business education is probably more threatened than any other industry I can think of by the arrival of this technology. We need to adapt our curriculum and build links with new recruiters very quickly. This kind of story you see all the time, every week in the papers: You have very different jobs being hired and there’s a lot fewer of them than before. I think being in denial or ignorance about this is the very worst thing that you can do. Let me now talk about the details of the blockchain. I hope that by the top of the hour you guys understand how this works, what some of the potential uses of this are. The blockchain is actually not a new idea. There are really two big ideas. 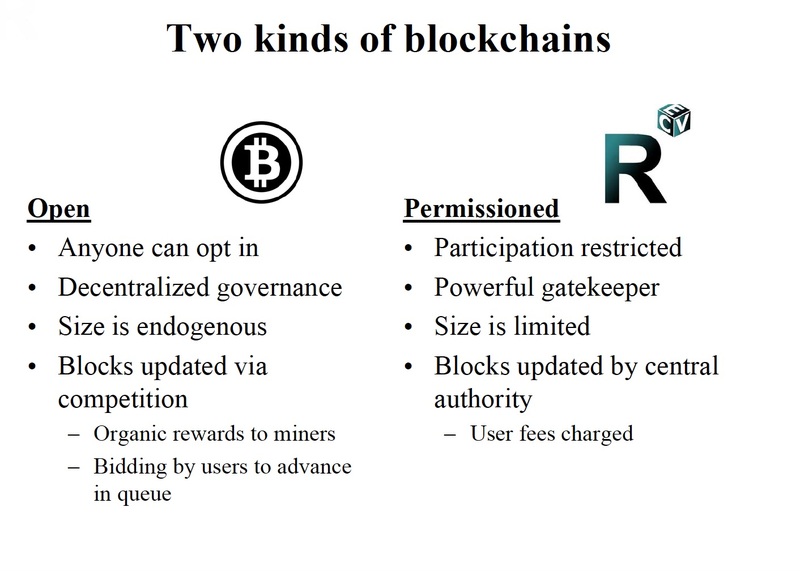 One is a blockchain and the other is something called a distributed ledger or a shared ledger. Both of them come out of an academic paper that was written back in 1991.The authors were data scientists who were working at Bell Labs. In other words, they were interested in authenticating intellectual property. In a world where a lot of the valuable property is maybe a track of music or a computer file or whatever, it’s virtual property, proving ownership is much more difficult than putting a fence around it or stamping it with a seal. They proposed the structure of a blockchain where you would arrange the records in a certain sequence. You would validate the records by showing that they have a certain point in the chain, and then you ensure the ledger with everybody so that the public could look at it, and if you tampered with any one of the records it would throw the whole thing off and you could call someone a fraud if they were a fraud. This idea was actually a very successful one, in that it led to a lot more academic research and some entrepreneurial applications, but it was taken to the next level. It took 17 years, but in 2008 it’s brought into the world of financial services by a mysterious character called Satoshi Nakamoto, who to this day remains unidentified. We don’t know who this person was or maybe a group of people. There have been a number of suspects. This is an intriguing mystery that is one of the curiosities of this whole thing. What Nakamoto did was take the work of Haber and Stornetta, these two authors, and introduce an incentive scheme and a number of other clever cryptographic devices and create what he called a peer-to-peer payment system. More or less along the lines of what Milton Friedman was talking about in that video clip. He publishes a white paper on an Internet bulletin board and it really reads like a manifesto. There’s just a lot of declarative sentences that condemn the current financial system. He says that “Commerce on the Internet has come to rely almost exclusively on financial institutions serving as trusted third parties to process electronic payments.” By this he means MasterCard and Visa. He then goes on to say that these people are very expensive, and because the cost of dispute resolution is so high, what he calls micro-payments, small transactions, are all but impossible. You can’t spend two dollars on electronic commerce and so forth. He says there’s got to be a better way. What’s needed is an electronic payment system that is based not on trust, but instead on cryptographic proofs. He creates this thing called Bitcoin, which some eager volunteers program up, and it goes live on January 3, 2009. Bitcoin has been operating now for a little over eight years without any successful hacking or takedown. It’s in fact incredibly surprising how resistant this has been in a world where financial compromises occur all the time. I had two credit cards hacked just last week and I think many of you have had similar experience. Anyhow, what’s on the blockchain? It’s data that in many ways is completely ordinary and unsurprising. You have a person who has a certain number of Bitcoins at their address and they want to send them to the next person and so this is the number that they are going to send. They have digital addresses. This is where it came from and where it’s going. The next transaction it would be where it came from, the next person who gets it and so forth. You have to provide what’s called a private key. This is essentially a password that authenticates the transaction. Source destination, timestamp, amount, this is very ordinary information that you might find in the ledger of a bank. By itself, this is not particularly remarkable, but the way it’s put together and organized in the database is really completely unique. 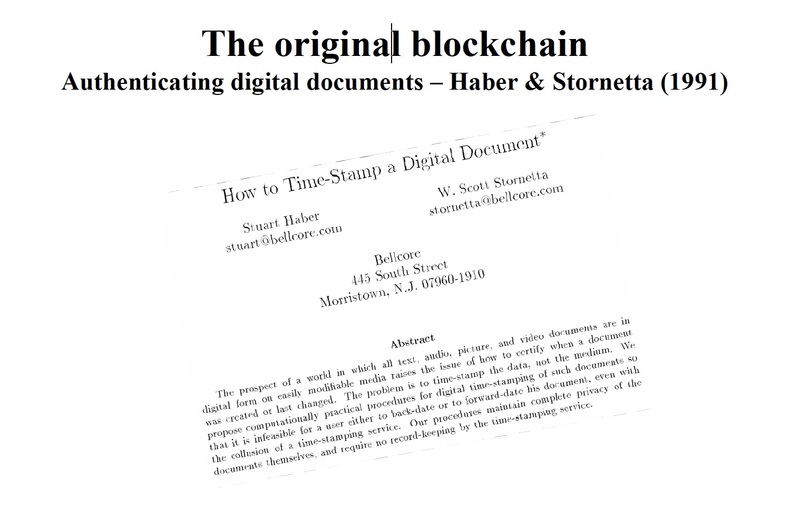 In the world of Haber and Stornetta, every transaction was its own block. You would just sequence stuff together. They weren’t particularly worried about storage requirements. But if you’re going to have a payment system [where] there are going to be thousands, even millions of transactions, you have to worry about computer memory. That’s a design choice. You could start your own currency and have a faster cycle time or a different block size. In fact, people have done this. There are now more than 700 of these digital currencies. The way these blocks work is that they hold a bundle of transactions. Here they’ve drawn in just four transactions, A, B, C and D. Imagine there’s 2,000. What you do is you consolidate these using what are called hash functions. H of A is the hash function of transaction A. H of B is B’s hash function and so forth. 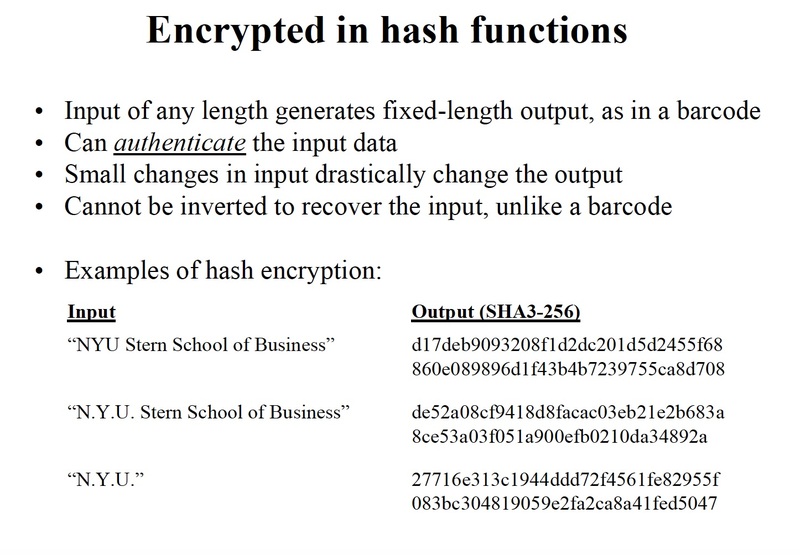 I’ll come back to this, but we need to understand, what is a hash function? These were developed by the National Security Agency in Washington and are the workhorses of modern cryptography. You see that you get the digits zero through nine and the letters A through F. If I put periods, but otherwise leave it the same, you see that I get another hash function that is almost completely different from the first. There’s almost no way to connect the first to the second and to tell it is just a small tweak. The properties of a hash function are that they are always a fixed length, which means you can’t really tell what the length of the input was. A small change in the input leads to a vast change in the output, so that if you’ve tampered with even one digit in the transaction, it’s obvious that the whole thing is different. You can’t go backwards. This is one thing that’s quite different from a barcode. I can scan a barcode, like the one on my airline boarding pass, and it will say this is Dave in seat 27A. It recovers the information that went into creating the code. You cannot do this with a hash function. It is a one-way type of cryptography, which means that if you wish to hack this, the only way to hack it is by trial and error that requires essentially so much computational brute force as to be all but impossible. 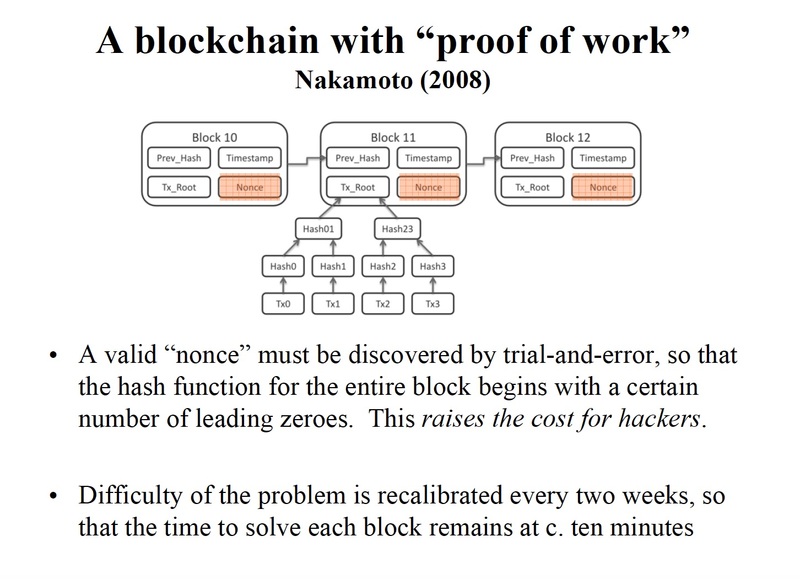 What Nakamoto does on the blockchain is he hashes all the transactions one by one, and then one thing that you can put into a hash function is another hash function as input. This thing called H of AB is actually just hashing A and B together into a single hash function. What you do in the Bitcoin blockchain is just concatenate these things. You put two together and then you put those together and so forth, to the point that you get something called the root. It is called the Merkle Root, named after Ralph Merkle, who is a father of modern cryptography. You can take 2,000 hash functions and condense them into one. If you change even one decimal point or digit of any of the input functions, it throws off the whole tree. That’s sort of the value of distributing the ledger to everybody. What fraud means is that you go change a number. Anybody who does this will throw off the entire ledger, and you won’t need an auditor to go through with a fine-tooth comb looking to see if anything’s gone wrong. The fact that something’s been changed will be obvious to everybody. Now, the last thing that goes into each block is in addition to the transactions, you take a hash of the header of the previous block. This is the chaining of the blocks. 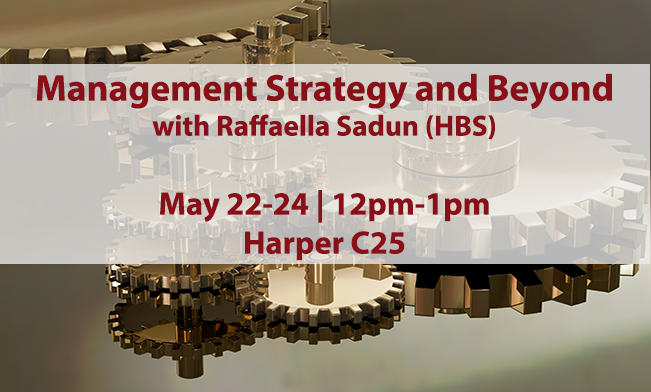 This is one of the really clever ideas of Haber and Stornetta. I’m going to take all these transactions and then combine them with the hash of the previous block, and then include that in the next block, so that each block depends on the block before it. If I change just one of these transactions, not only does it throw off this whole block, but it throws off every other block into the future. Somebody who wished to tamper with this ledger would have to recreate every single block with all these hash codes. The computational difficulty of this is prohibitively difficult. There’s no computer in the world fast enough to do this before the honest people code in the next set of new transactions. This is a really clever way of assuring the security of data. For thousands of years, we’ve relied on trusted third parties—bank inspectors, accounting firms, and so forth—who come in and do spot checks of records. But here we have a system where if anybody changes even one number or backdates even one timestamp, it throws the entire ledger off, and it throws it off at exactly the point where they tampered at it. Not only can we tell that somebody’s cheating, we can tell exactly where and when they’re cheating. I think the way you want to think about the importance of this is, what did accounting look like before and after double entry bookkeeping came in, in the Renaissance? That’s about 500 years ago. Double entry bookkeeping had a profound effect on forcing people to behave honestly, because records had to reconcile with each other in a certain way that was internally consistent. This takes it to the next level, maybe the next level squared. It makes things line up in a way that is mathematically infallible, impossible to tamper with, and doesn’t really require you to call in that trusted third party to sign off on things anymore. Now, accounting firms don’t see it this way. They’re trying very hard to create this as an opportunity for them. But I think this is really, really different than what we’ve had before. It forces you to ask a lot of these questions about why do we need these gatekeepers and validators who’ve been part of the system for hundreds or thousands of years. 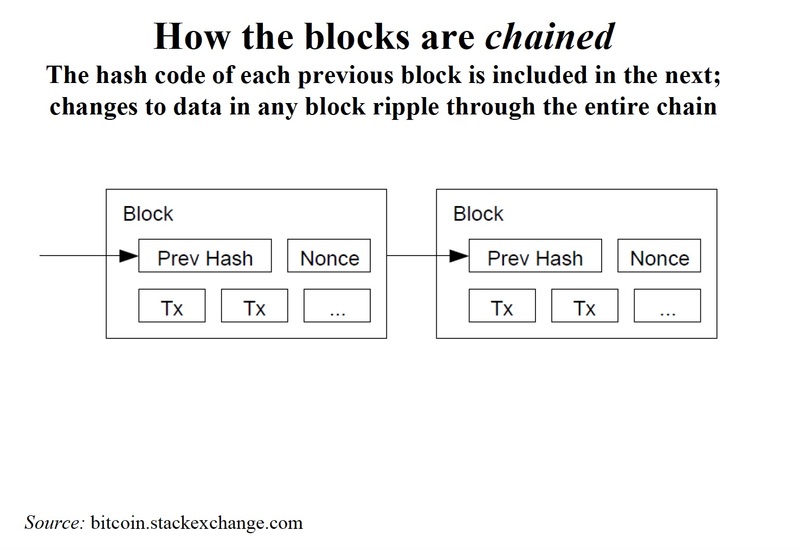 Again, the chaining of the blocks, the key insight here is simply that each block depends on the hash of the block before it. If I change one aspect of one block, the whole future of the chain gets perturbed and thrown off. 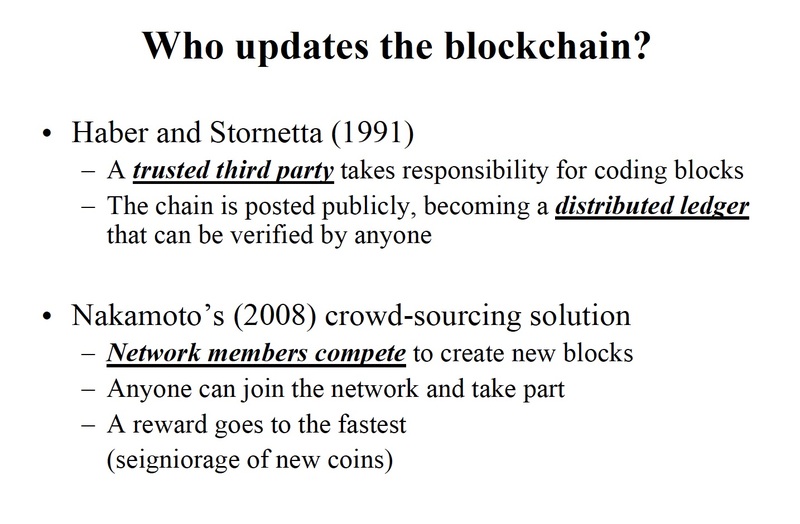 If you go back to the model of Haber and Stornetta, they proposed some trusted third party would have the authority to write each block into the chain. But they would then have to make the ledger public, so that they would crowdsource the inspection of it, that everybody could see the records. Nakamoto looked at this very differently. He said, “There is no such thing as a trusted third party.” We see third parties all over the world, and they behave badly. They act as gatekeepers who ration access. They charge fees, like a monopolist would, since they control who can use it. They sometimes change the ledger to favor their friends. Maybe not in this country, but certainly in other countries like Russia, friends of Putin get extra bank deposits and so forth. They become single points of failure, where if the bank goes down, nobody can use their debit card for the afternoon, and so forth. They decide when the market will be open, and it’s usually not open very much, because they want to play golf, and so forth. If you kind of read down this list of problems, and you think ‘this sounds a lot like the banking system we have,’ that’s kind of the point. Rather than put this in the hands of these ruthless people, Nakamoto decided to crowdsource this. He creates a solution where blocks are going to be coded through the cooperation of the community, with an incentive system motivating them to take part in this. The way it works on the Bitcoin network—and I would call this the open model, or a public blockchain—is that anybody can write the next block, but you have to compete with other nodes on the network. Every 10 minutes with Bitcoin, there’s actually a reward put out, which is 12.5 Bitcoins. At current market prices, that’s somewhere north of $10,000. If you can successfully code the next block before anybody else does, you get those Bitcoins. This is actually money creation, or seigniorage. It gets rewarded on a competitive basis. What he’s really created is something that he calls competitive accounting or competitive bookkeeping. That you set up a race between anybody who wants to be a bookkeeper, and whoever can do it the quickest is going to win. Now, you would think that this would be easy, that anyone with a fast computer could bundle these transactions and hash them and take the hash of the last block and so forth. But he makes the problem difficult, because you don’t want hackers and spammers entering into this and subverting the system. 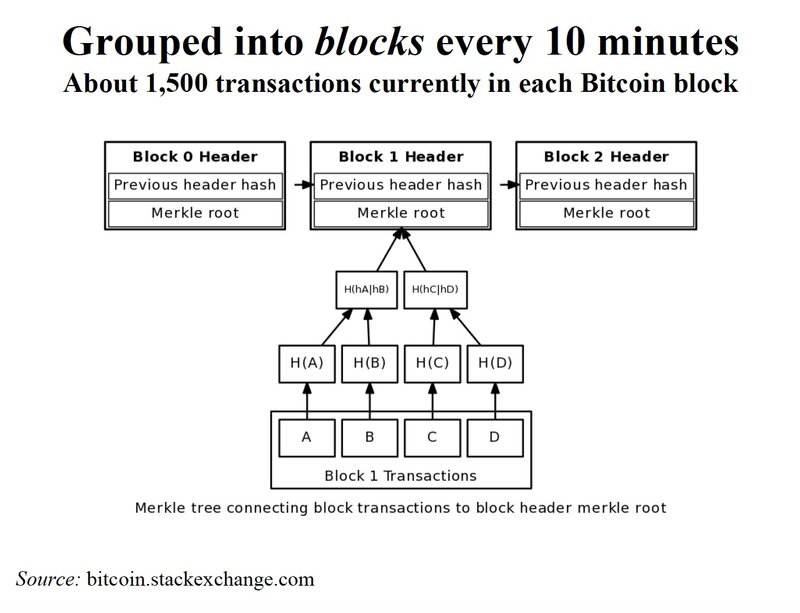 What you need to create a block is actually four elements, the transaction, the Merkle Root that we talked about before, you need the hash of the previous block, you need the timestamp, and you need this one other thing called the nonce. The nonce is a proof of work strategy that raises the cost for anybody who wants to enter this competition. What it is, is a random number that can’t be solved for or derived in any way. It can only be found by pure trial and error guesswork. It’s a random number that when combined with these other three pieces of data generates a hash function below a certain critical value. In other words, a hash function with a certain number of leading zeros. Imagine that I required you to guess a random number that when I put it together with all the other data, created a hash where the first 13 digits were all zero. I wouldn’t get this right away. In fact, I might have to guess about a billion random numbers before I actually found it. What you need to play in this game is basically a very fast super computer. In the early days, you could do this at home with a laptop. Then as Bitcoins started becoming valuable, you needed a special graphics card that would make the thing go faster. But today, people have dedicated hardware that’s basically custom designed only for Bitcoin mining. The real cost of this is actually the energy required to power the super computers. There are big bunkers in places like Iceland, where people do nothing but mine for Bitcoins all day. This is called mining, because Nakamoto said this is analogous to mining for gold in the old days. That as a reward for keeping the books faster than anybody else, we’re going to give you new Bitcoins. You’re going to compete for them just like gold miners looking for the next big strike in California. What’s attractive about Iceland is that you get geothermal energy for free from the ground, so you don’t have to pay the electric bill. Most of these people today are actually in inner Mongolia. The reason is completely bizarre. The local government built a big hydroelectric dam, and then the national government refused to take the electrical power, because of some political rivalry. It’s just total local politics, settling scores. They have all this electricity that they can’t use. They’re willing to give it away for free to anybody who will move next to the dam. So now you have a zillion Bitcoin mines taking this free power. 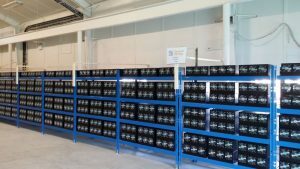 All the Bitcoin mines in the world are either in inner Mongolia or Iceland, which is the two most unlikely places. Anyway, there’s a lot of color in this industry. But what you have are thousands of miners competing with each other and updating the books in way that’s extremely efficient. What you’ve moved from is a model where you’ve got, say, four retail banks, or stock brokerages, and a clearing house like the DTCC in New York, which keeps the master ledger [that] is the authoritative one. In Nakamoto’s system, we all trade with each other. We all have a copy of the same ledger, and we all share responsibility for updating it. What’s gone, of course, is the clearing house. This is the problem that all the banks are facing. If you do this stuff on a peer-to-peer basis, you really don’t need somebody being the authority for which trades count, because this is being done endogenously on the network. Let’s say you want to steal somebody’s assets that are already somewhere on the blockchain. You want to go back, let’s say to block 74, and change a transaction. This is what fraud or theft would be. If you do this, everybody else is already working on block 91 up here. For this block to be built successfully, all of these other blocks in between, in sequence, have to have the right hash codes. If you were to steal something here, you would have to redo all of these other blocks in the 10 minutes before these people do the next block. In other words, what you’d basically need is a computer that is 17 times faster than anybody else’s. To the best of our knowledge, this doesn’t exist. I get asked a lot “what about quantum computers and Putin’s secret computers?” and so forth. We need to worry about these things. There’s definitely threats from development of ultra-fast hardware and so forth. If anybody figures out how to invert a hash code, this would be a big problem. But I think the bottom line is these concerns are greatly less than the concerns in the financial system that we already have. This is not without risk and without danger, but if you think about how often the system of SWIFT codes and credit card ID numbers and so forth are hacked, it’s almost a daily thing to the point where we just take it for granted it will happen with a certain frequency. I think it’s important to be mindful of the technical issues here. But they are greatly less than the ones that we already have. As I mentioned before, this is really the battle that’s being fought out: Will the world follow the model of Bitcoin with an open source blockchain system? This is attractive because it’s so democratic, that anybody can join. No one rations access to it. Governance is purely democratic, and there’s open competition. This network basically grows and shrinks according to user demand. The alternative is what’s called a permissioned blockchain. There are many industry consortiums, the most well-known of which is an organization called R3CEV (R3). What they’re doing is saying, this system is too dangerous. Your data is seen by too many people. Hackers and Chinese mining communities can get in and see your data. Therefore, it’s important to still restrict access and have a central gatekeeper. R3 is a consortium of 70 major banks. These are all the banks that you would have heard of: JP Morgan, UBS, Barclays, many Asian and Australian banks, and so forth. They’re working together on 20 shared platforms that would use blockchains to trade everything from foreign exchange to credit default swaps to commercial syndicated loans and so forth. I don’t want to minimize the importance of this. I think what you’re going to see, maybe as soon as this year, is a lot of the world’s major banks transitioning the way they exchange assets to blockchain based platforms. R3 is not the only one of these consortiums. There’s another group called Hyperledger that’s working on this. But essentially the issue of who gets part of this is one that I see as a very interesting one for the competition authorities in particular. If there’s 70 banks in R3, what if I’m bank 71? What if I want to play, and under what conditions? But on the other hand, these 70 banks are funding the development of this thing, and they don’t want other people to come in and free ride on their R&D. Some interesting questions will have to be sorted out down the road. These are the legacy banks looking for ways to protect their franchise. There’s no long and short about it, they don’t want to disappear. 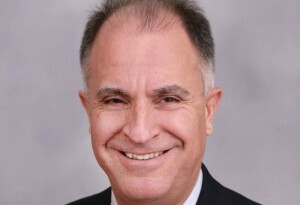 I think what’s happening at R3 now is among the most important things going on in the capital markets, and will determine an awful lot about what the markets look like. I’ve been to meet them and visit their office in New York. It’s like a bunch of kids in hoodies. I’ve been up to the NASDAQ, where they have a Vice President for Blockchain. These are like very young people who might have gone to college, maybe not, but they are showing up on skateboards with Starbucks and so forth. They work whatever hours they want, and they know how to code. People ask me for career advice all time. I say, “You need to learn to program in Python and do a lot of this Big Data stuff.” It’s very unsettling to people. These are not people who wear three piece suits and interview at the AFAs and so forth. What are the uses for this? The digital currency case I think is very obvious. Bitcoin now has an eight-year track record of data. But it’s hardly the only thing that you can put onto a blockchain: trading shares of stock, trading bonds, contracts such as credit default swaps and so forth are all very obvious applications. Things like tickets to movies or the keys to your cars, patent records, charitable contributions and so forth. Almost anything tracked on a database could probably be tracked cheaper and with greater accuracy on a blockchain than under the current systems we have now. I wrote an academic paper last December, just over a year ago, where I said that before long there may be some company going public on a blockchain. This actually happened before the month was out. December 30th, 2015 was the first ever blockchain IPO. It was on a platform that the NASDAQ in New York had developed. They now have a blockchain market called the NASDAQ Link. Their thunder was quickly overtaken by the Australians. The Australians made an announcement just under a year ago, in January of 2016, that they were going to retrofit the entire Sydney Stock Exchange, the ASX, with a back-end blockchain system for clearing and settling. This is not one company on some experimental thing. This is like a real stock market in a real country. They’re going to switch the whole thing. It’s supposed to start next summer, if it stays on schedule. Since this time, among many other markets, I’ve lost track, but I know that Zurich and New York are looking at this very closely. I think before long, all the stock markets, the back end, are going to embrace this blockchain as a way of greatly reducing the cost and time to settle trades. But what about this idea of listing your securities? Not just the clearing and settlement, but the actual marketing of the shares on a blockchain on a peer-to-peer basis? This is sort of what I was referring to earlier with Uber with Airbnb, that you could go public and you could do it if an organized exchange welcomes you onto a blockchain platform. But you could also skip the exchange completely and just start your own blockchain. Uber could start the Uber Equity Blockchain, and say, “We have a million shares of stock for offer on a peer-to-peer basis.” They could update it with mining every 10 minutes, just like Bitcoin and so forth. How would this thing finance itself? You could either pay user fees for every share traded, or you could have endogenous rewards to outsiders who competed for them. In other words, you could decentralize the entire market for the company shares. Would you want to do this? One reason you might want to do it is that there’s a seven percent underwriting spread in the equity markets that everybody doesn’t feel so happy about paying. But there’s all kinds of other asymmetric information, screening effects that not everyone who wishes to can easily sell shares into the market. I think that the future of corporate finance looks very much like this. The first ever blockchain issue in this format actually took place just over a month ago, in November . It’s a company called Overstock.com. They put out a preferred stock issue on their own blockchain. It was really to prove the concept, because they want to sell this blockchain to other companies. I’ve been down to the SEC, and they’ve got their hands on my paper. I was there for a totally different purpose. They called me into this conference room where the head of the division of corporate finance was there, with a bunch of lawyers. That’s how Nakamoto designed it. This completely bypasses all existing sovereign control and regulation, because it’s not in any identifiable location. It raises huge problems that, at the very least, will force the U.S. to rewrite the securities laws to accommodate this. I think every country in the world is going to have to take a bottom-up view of the laws of banking, securities markets, credit markets, and so forth to accommodate what’s a real paradigm shift in technology. They angrily kicked me out, and then they called me back two days later. They said, “Do you want to come down and explain this again?” Then they invited me back for a third time. At this point, regulators around the world really understand, and are actively seeking advice from tech people and people in the industry. There’s a really interesting change going on that’s going to change the way that customers and investors interact with each other. The government is going to have to think very differently about how, and even if, they can oversee this. Let me point out a few more examples: One of the areas where blockchains are already being used very actively, in this enormous market, is in logistics and supply chain management. BHP Billiton is the largest mining company in the world. They dig up iron ore, gold, and other metals. Then many vendors and suppliers handle the inventory, refine it, give it back, ship it. This is a massive inventory tracking problem. They’ve decided that they can do this much better on a blockchain than under the technology that they’re already using. [BHP] is a firm with revenues in the direction of 100 billion a year that is introducing a very new technology for a very old problem. This is one little corner of finance that we sometimes call “working capital management,” but blockchains have a huge footprint that they probably will leave across this one sector of the economy. Another example is authenticating luxury goods: My wife likes to shop for Louis Vuitton purses and Chloe handbags, and there is a constant worry that these are counterfeit. There are other people who like to buy gemstones and want to be sure that these are not conflict diamonds that were mined by Islamic State slave labor in some corner of Africa or something like that. There are museums with priceless art collections where the provenance and the ownership of the work is somewhat in doubt. All of these things can be authenticated through blockchain databases that either trace the chain of custody, approve that ownership transferred hands at a certain time, or that in a limited edition of prints that there really are only 100 prints and they can all be found on this blockchain. 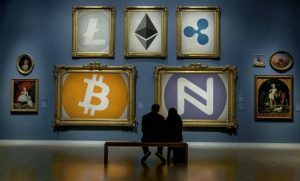 Authenticating fine art seems to be a very nice opportunity for blockchains. I spoke at a conference last summer in The Hague in the Netherlands with people there from INTERPOL and art museums, who are looking actively at a worldwide art registry that they’re going to put on a blockchain that would ultimately be used to deal with things like the restitution of art stolen by the Nazis in World War II and those kinds of problems. Government records: Somebody in Argentina who’s a real believer in the technology didn’t get a regular birth certificate for his child. Instead, he made a 20-second video clip on the day the baby was born, and then hashed it into the Bitcoin blockchain as proof that the baby existed on that day and included all the vital statistics, gender, height, weight. All the information you would have on a birth certificate. This may be the future of vital statistics in government—not just birth certificates, but immigration records. The Australians are very aggressively going for a blockchain national ID program. They say this will be used for everyone from the border police to the tavern keepers who want to check your age. You won’t even have to tell them your age. The blockchain will just return over or under age 17 and so forth. The limits to what you can do with this, especially in the public sector, are almost beyond imagination. But a huge amount of entrepreneurial activity is going into imagining new use cases and thinking about how to develop them and get governments interested in using them. « Amazon at $1,000 – Should We Be Celebrating?